The global electric vehicle battery recycling market was valued at $138.6 million in 2017, and is projected to reach at $2,272.3 million by 2025, growing at a CAGR of 41.8% from 2018 to 2025. Batteries are used as a secondary power source with the introduction of first automobile. Electric vehicle battery or traction battery power the propulsion of battery electric vehicles in the market. Electric vehicle battery is a secondary (rechargeable) battery. It uses chemical energy stored in rechargeable battery packs for power; and therefore, does not require any combustion engine for propulsion. These batteries reach a point called end of life and after this are replaced with a new one. The valuable materials within each of these batteries, which reach end of life, can be recovered and recycled to optimize the use of finite metal resources. Aluminum, cobalt, nickel, lithium, and other types of metals can be recovered from these batteries, which reach end of the life. The major companies profiled in the electric vehicle battery recycling market share include ACCUREC Recycling GmbH, American Manganese Inc., Battery Solutions, LI-CYCLE CORP., G & P Service , Recupyl, Retriev Technologies, SITRASA, SNAM S.A.S., and Umicore. The electric vehicle battery recycling market size is segmented based on application and region. Based on application, it is categorized into electric cars, electric buses, energy storage systems, and others. Based on region, the electric vehicle battery recycling market is analyzed across North America, Europe, Asia-Pacific, and LAMEA. 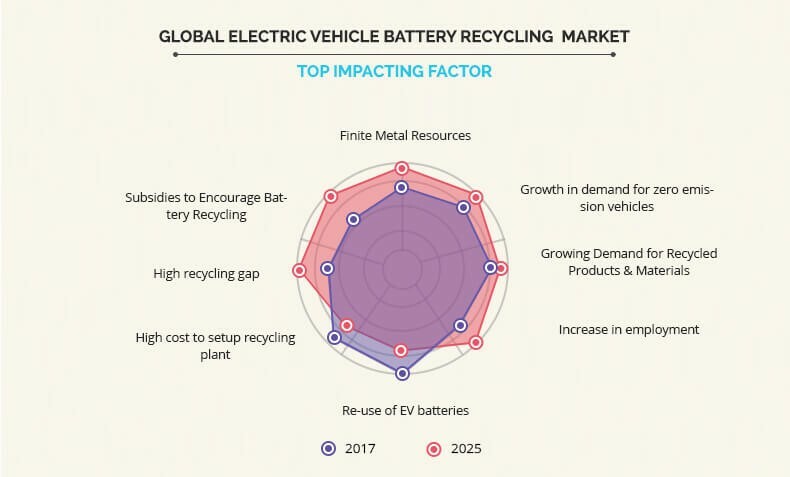 Factors such as finite metal resources, growth in demand for zero emission vehicles, rise in requirement for recycled products & materials, and increase in employment drive the electric vehicle battery recycling market growth. However, re-use of EV batteries and high cost to setup recycling plant restrict the stated market growth. Further, high recycling gap and subsidies to encourage battery recycling makes way for electric vehicle battery recycling market opportunity. On July 29, 2017, Britain joined France in pledging to ban the sales of gasoline and diesel cars by the end of 2040 to reduce the toxic vehicle emissions. This results in the excess demand for the electric vehicles and thereby battery components and raw materials such as lithium, nickel, cobalt, aluminum, and others. Battery makers are struggling to control supply of the raw materials used in the production of these battery packs as the resources are finite and expensive. This results in recycling of the batteries, which have reached its end of the life. The process extracts the vital components from such batteries, which can be used further in other applications due to the scarcity of the supply of metal components, such as nickel, cobalt, and more. This in turn supplements the growth of the electric vehicle battery recycling market. Increase in global concerns regarding the negative effect of climate change along with alarming pollution levels recorded in the major cities have created a significant demand for electric vehicles. The demand for fuel-efficient vehicles has increased recently owing to rise in price of petrol and diesel. This also results in depletion of fossil fuel reserves and growth in tendency of companies to gain maximum profit from these oil reserves. Thus, these factors give rise to the need for advanced fuel-efficient technologies, leading to surge in demand for electrically powered vehicles for travel, which generate demand for the batteries. Once these batteries reach end of their life, they are be recycled. The first batch of batteries from electric and hybrid vehicles have reached their retirement age. The total number of batteries which are retired from electric bus and car equals to around 55,000 units and is expected to be recycled in 2018. Thus, increase in demand of electric vehicles drives the growth of the electric vehicle battery recycling market. Various companies are working on effective techniques to recycle lithium-ion batter in optimized manner after analyzing the potential demand for the recycled raw materials such as nickel, cobalt, lithium, and others. For instance, Kemetco is working with American Manganese to develop a scalable and commercialized recycling technology for Lithium-ion batteries, which is low cost as well as environment friendly. In addition, the amount of the recycled lithium is expected to satisfy 9% of the global demand for lithium in various applications. More than 66% of the spent EV batteries are expected to be recycled in China, which are used to serve the country’s fast growing battery material industry. The overall electric vehicle battery recycling industry potential is determined to understand the profitable trends to gain a stronger foothold. The electric vehicle battery recycling market analysis report presents information related to key drivers, restraints, and opportunities with a detailed impact analysis. The current electric vehicle battery recycling market forecast is quantitatively analyzed from 2017 to 2025 to benchmark the financial competency. The electric vehicle battery recycling market holds high potential for the automotive industry owing to its importance of vital metals present in an electric vehicle. At present, there is an increase in demand for the electric vehicle battery recycling from developing countries such as China, India, and others owing to the increase in sales of EVs. Companies in this industry adopt various innovative techniques to provide customers with advanced and innovative product offerings. Factors such as finite metal resources, growth in demand for zero emission vehicles, rise in need for recycled products & materials, and increase in employment fuel the growth of the electric vehicle battery recycling market. However, re-use of EV batteries and high cost to setup recycling plant restrict the market growth. Further, high recycling gap and subsidies to encourage battery recycling makes way for growth opportunities for the market expansion. Among the analyzed regions, Asia-Pacific is expected to account for the highest revenue in the global market throughout the forecast period (2018-2025) followed by Europe, North America, and LAMEA. 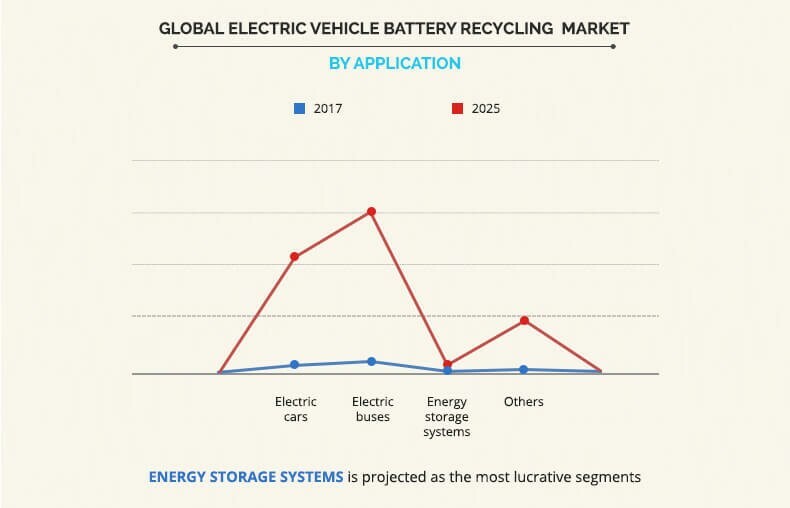 However, LAMEA is expected to grow at a higher growth rate, predicting a lucrative market growth for electric vehicle battery recycling owing to the expected increase in vehicle sale. 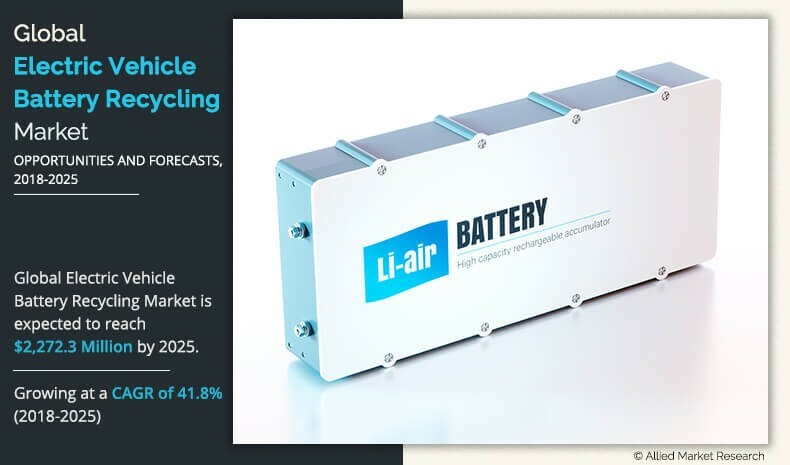 ACCUREC Recycling GmbH, American Manganese Inc., Battery Solutions, LI-CYCLE CORP., G & P Service, Recupyl, Retriev Technologies, SITRASA, SNAM S.A.S., and Umicore are the key market players that occupy a significant revenue share in the electric vehicle battery recycling market. "Electric Vehicle Battery Recycling Market"